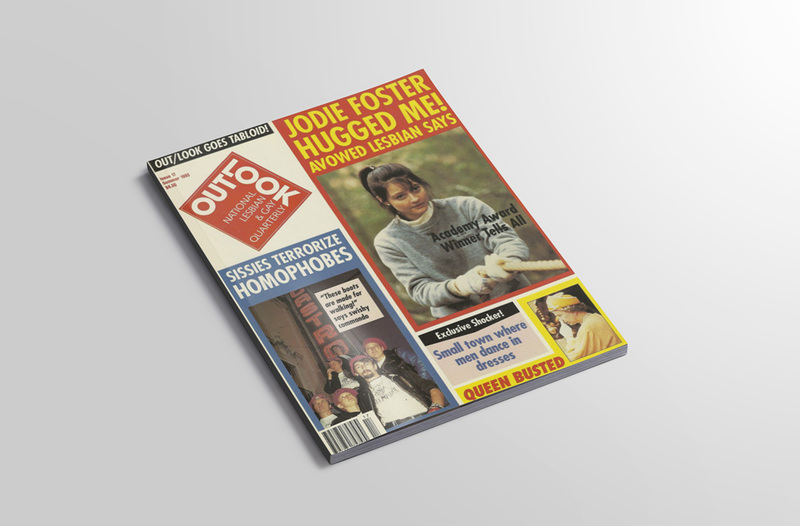 View OUT/LOOK Issue #17 at the Lesbian Poetry Archive. 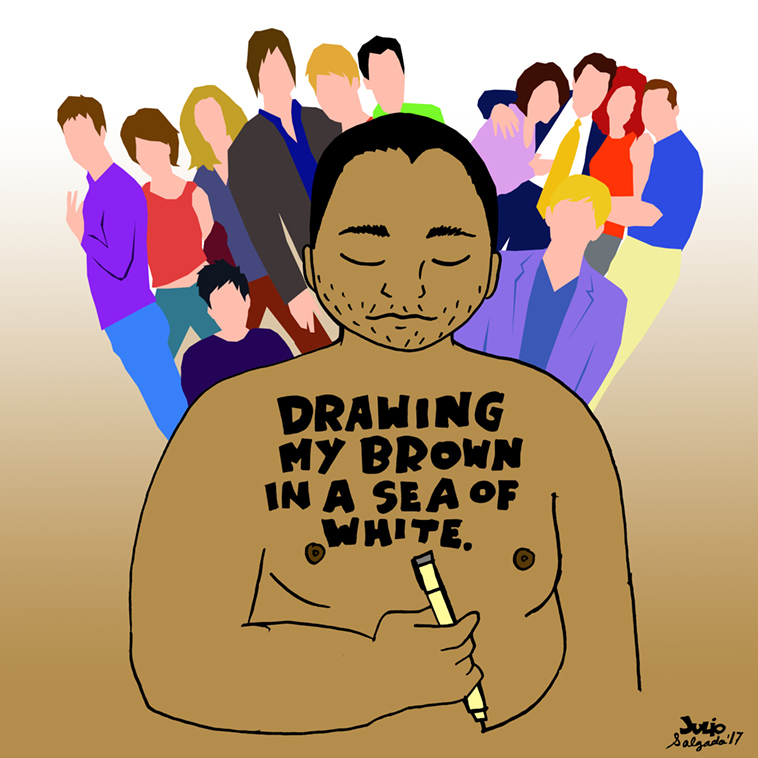 “Drawing My Brown In A Sea of White” is based on the article “Han Ong Writes Himself” from OUT/LOOK, Issue 17. Lately, I’ve been creating a lot of self portraits where I touch on subjects about my immigration status, queerness and brown body. As I read thru this playwright interview, it resonated with me in how as artists of color we must keep on telling our own narratives because nobody is going to do it for us. Watching shows like “Will & Grace,” “Queer As Folks” and Ellen DeGeneres on the cover of Time Magazine as a teenage queer of color, I was thankful to be able to see how queer stories were being told in main stream media. Yet part of me, the part that did not fit with the gay white narrative, felt like something was missing. Sometimes these queer shows treated race like a joke or maybe they would give us a sexualized queer character of color that was written by a white person. While these shows were sometimes helpful in how I navigated queer spaces, I resorted to art and political posters to take ownership of my own story. This image is a reflection of that experience. Julio Salgado is the co-founder of DreamersAdrift.com and project manager for CultureStrike. 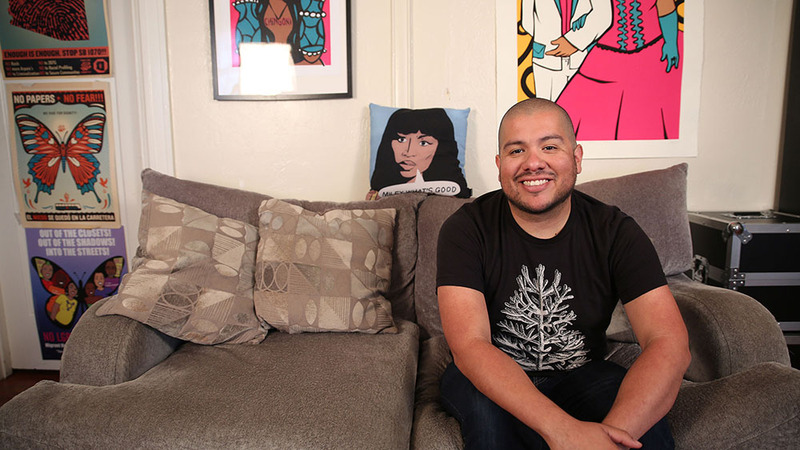 His status as an undocumented, queer artivist has fueled the contents of his visual art, which depict key individuals and moments of the DREAM Act and migrant rights movement. Undocumented students and allies across the country have used Salgado’s artwork to call attention to the youth-led movement. His work has been praised by OC Weekly’s Gustavo Arellano, KPCC-FM 89.3’s Multi-American blog and the influential journal ColorLines. In July 2012, Salgado and other undocumented activists joined Jose A. Vargas on the cover of Time Magazine. Salgado graduated from California State Universitiy, Long Beach with a degree in journalism. To see more of his artwork and other collaborations, you can go to juliosalgadoart.com.